Before the war, Dr. Stephen Tracy had devoted much of his medical career to the care of women and children. 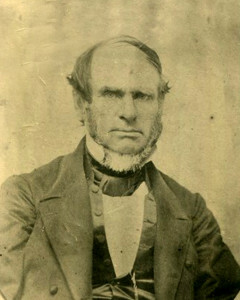 A native of Vermont, Tracy and his wife Alice had been in 1836 part of a group of missionaries sent from the Andover Theological Seminary to Singapore and then Bangkok. Upon his return to the U.S., drawing on his familiarity with attending young women who had been “deprived of those necessary instructions from their elder and more experienced friends,” he authored “The Mother and Her Offspring,” which offered straight-forward (and accurate!) information conception, pregnancy, lactation and infant care. He also saw the need for formal medical education for women and became a professor of obstetrics and diseases of women and children at the New England Female Medical College in Boston. But like many others, the outbreak of war changed his circumstances. His son, William Warner Tracy, enlisted at the age of seventeen in September, 1862 as a private in Co. D of the Mass. 45th Infantry. Dr. Tracy himself was appointed and qualified coroner for Essex County in September 1863. In August 1862, he was named to the Andover citizen’s committee and presided over the May 1864 meeting that decided to send representatives to assist the Spotsylvania wounded. He also provided successful and attentive care to Andover soldiers home on convalescent leave, including Horace Holt, with a gangrenous abdominal wound, and amputee Augustine K. Russell. Dr. Tracy died in 1873 and is buried in the Phillips Academy cemetery.